Jayne Marks is questioning the choices she has made in the years since college and is struggling to pay her bills in Manhattan when she is given the opportunity to move to Paris with her wealthy lover and benefactor, Laurent Moller, who owns and operates two art galleries, one in New York, the other in Paris. He offers her the time and financial support she needs to begin her career as a painter and also challenges her to see who and what she will become if she meets her artistic potential. Laurent, however, seems to have other women in his life and Jayne, too, has an ex-boyfriend, much closer to her own age, whom she still has feelings for. 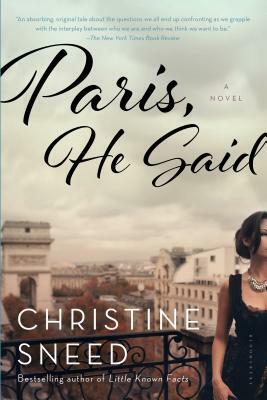 Bringing Paris gloriously to life, Paris, He Said is a novel about desire, beauty, and its appreciation, and of finding yourself presented with the things you believe you've always wanted, only to wonder where true happiness lies. Christine Sneed is the author of Little Known Facts. She has a creative writing MFA from Indiana University and teaches creative writing at DePaul University, Northwestern University and Pacific University. Portraits of a Few of the People I've Made Cry won AWP's 2009 Grace Paley Prize in Short Fiction, was a finalist for the Los Angeles Times Book Prize, first-fiction category, was named the Chicago Writer's Association Book of the Year, and the recipient of Ploughshares' 2011 first-book prize, the John C. Zacharis Award. It was also long-listed for the Frank O'Connor International Short Story Award and named one of the seven best books of the year by Time Out Chicago. Her stories have appeared or are forthcoming in Best American Short Stories, PEN/O. Henry Prize Stories, Ploughshares, Southern Review, Massachusetts Review, New England Review, Notre Dame Review, and a number of other journals. Visit her website at http://www.christinesneed.com.